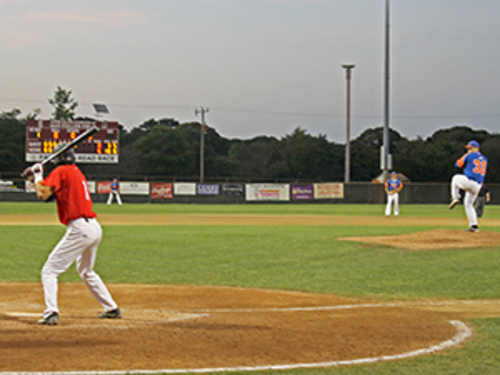 The President’s Trophy winning Commodores defeated the fourth-seeded Hyannis Harbor Hawks 6-0 at Guv Fuller Field in game one of their opening round playoff series. Like many other times this season, the Commodores were led by right-hander Jeff Passantino (Lipscomb) on the mound and outfielder JJ Matijevic (Arizona) at the plate. Passantino threw six shutout innings and Matijevic broke the scoreless tie in the third inning with a three run round-tripper. Matijevic’s no-doubter would go on to be all the Commodores would need, as three relievers combined for three shutout innings to seal the victory. Game two of the first round series is tomorrow night at 6:00 p.m. in Hyannis. One would expect nothing less from playoff baseball than the showing between the No. 2 Wareham Gatemen and the third-seeded Braves in Friday’s game one of the first round of the West’s playoff series. The Braves took away the victory, 5-4, at the end of 10 innings when Braves’ closer, Jon Escobar (Holy Cross), pitched a 1-2-3 inning of strictly strikeouts to record the save. The game went scoreless through until the bottom of the fifth inning, when Cole Freeman (LSU) of Wareham gave the Gatemen a 1-0 lead with an RBI single. Bourne answered Wareham’s call in the top of the sixth, when Willy Yahn (UConn) tied the game at 1-1 with an RBI single. It was a game of back-and-forth, as Wareham answered with three runs in the bottom of the sixth to make it a 4-1 score. Joey Bartosic (George Washington) gave the Gatemen a 2-1 lead with his RBI single, followed by Adrian Tovalin (Azusa Pacific) who came to bat as a pinch hitter, squaring away a triple and driving in two. Bourne turned around and retaliated in the final five innings in total to complete its comeback. David MacKinnon (Hartford) had an RBI double in the seventh inning, while a sac fly RBI by Justin Yurchak (Binghamton) in the eighth made it a one-run game. Brennan Breaux (LSU) tied the game 4-4 in the ninth with his RBI single, and Jake Mangum (Mississippi State), pushed one up the middle to give the Braves the go-ahead run, 5-4 lead, and ultimate win in the top of the 10th. Also contributing to this story was Cape League Intern Amanda Cox.